There are lots of over the counter and prescription only remedies for heartburn and other symptoms associated with gastroesophageal reflux disease. One of the more frequently prescribed medications for this and other complaints associated with excess stomach acid is omeprazole, and one of the brand names it is sold under is Zegerid. Zegerid, like all other forms of omeprazole, is a proton pump inhibitor. These compounds work to reduce the amount of stomach acid present, which in turn decreases the chance of heartburn. Heartburn is caused by the back flow of acids from the stomach up into the esophageal tract, and this can cause severe discomfort in some people. 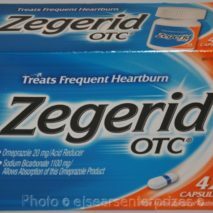 Because Zegerid works to decrease the amount of stomach acids, it is often used in conjunction with other medications to treat intestinal or stomach ulcers. It acts to suppress and eliminate a substantial amount of the corrosion while giving the treatment medication a chance to work. A non-prescription version of Zegerid is available for unsupervised, home use. Patients who experience severe acid reflux or full blown GERD (gastroesophageal reflux disease) may not find this version satisfactory, however. For chronic conditions, securing a doctor’s supervision is almost always the smarter route to take. Part of the reason for this is due to the potential side effects of the long term use of Zegerid and all other omeprazole varieties. While Zegerid is the only proton pump inhibitor currently approved by the Food and Drug Administration for the reduction of upper gastrointestinal bleeding in critically ill patients, all PPIs carry the same basic set of risks. Reported side effects may include slight nausea, some chance of a stomach ache, and perhaps diarrhea or constipation. These are reasonably typical side effects of medicines which act on the digestive system. If they occur with frequency or seem to be more severe or long lasting than anticipated, don’t hesitate to tell your doctor. You should inform your doctor immediately if any of the serious side effects of Zegerid administration manifest themselves. If you develop a rash, have difficulty in swallowing, or severe abdominal pain you should get in touch with your physician at once. He or she may have to discontinue the Zegerid regimen if these symptoms warrant it. The omeprazole content of Zegerid is contained in a granular powder which has been designed for suspension in liquid and given orally. Zegerid in powdered form uses sodium bicarbonate as a buffer agent, and patients with sodium related concerns should be made aware of this. Due to the sodium content it is also not recommended for physicians to prescribe two twenty milligram doses in place of one forty milligram dose. It is important to avoid bad reactions with other medication, so tell your doctor if you are taking anything like an anticoagulant, an anti-fungal medication, or benzodiazapines. Many people have reported great success with a prescribed course of Zegerid, and perhaps you will be able to put your acid reflux problems behind you if omeprazole treatment is appropriate for you.